But we’re not done, not by a long shot. Our research indicates that the most problematic places on our sites tend to be free-form comments, so we’re working diligently on coming up with a way that lets users express feedback through the system; this not only ensures that users see compassionate, actionable guidance, but also helps remove the perception that there are people taking pleasure in picking at their work. To that end, this post is here to highlight the user interface changes that have been made over the last weeks and talk a bit about the new text and how it furthers the goals of the Code of Conduct while also making flagging clearer for everyone. How can we make flagging easy and accessible to users? know that flagging is an option, particularly users who are unfamiliar with the sites. know how and when to use flags without making the flag dialogue too text-heavy or complex. We want to be particularly mindful of people who may not speak English as a first language. How can we make flag handling easy and clear for moderators? aren't overloaded with many extraneous/noisy flags by being clear about when flags are appropriate, particularly custom flags. can easily decide whether a flag is valid or not based on the flagging text. Making flagging obvious and accessible. There's a lot of discussion about how noisy having the flag icons permanently visible on the page on every comment you can flag would be. That's understandable. The question is, does the benefit of permanent visibility outweigh the extra noise it might create, or will it simply create noise for limited gain? If the latter, how can we address this while making flagging more accessible for everyone? When it comes to allowing <15 reputation users to flag comments, we're looking at how much this affects the flag queue for moderators - are we seeing a huge uptick in flags and, if so, are those flags marked helpful or declined? 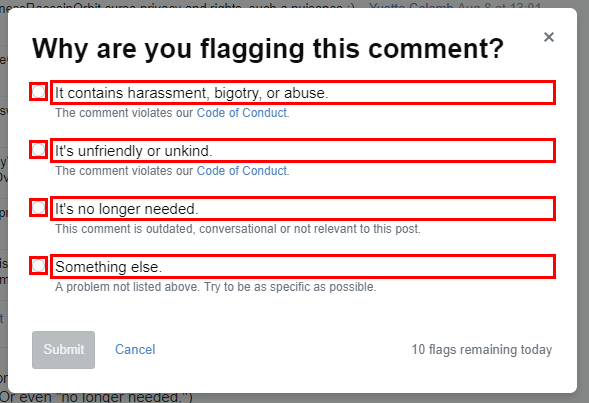 UPDATED: Adjusting flagging reasons to connect with the Code of Conduct. 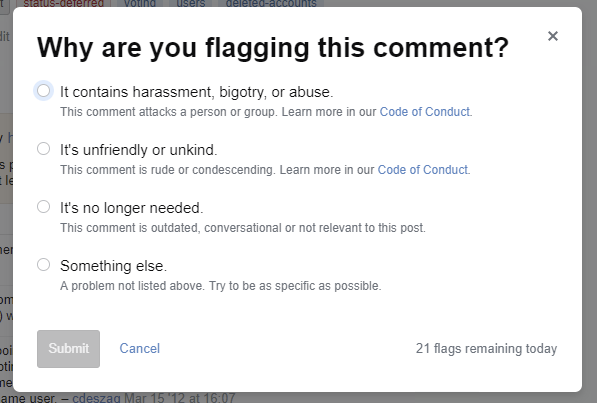 We've separated attacks on people or groups from general rude behavior and added explanations for each flag type. The first flag should be used for blatantly abusive statements while the second should be used for statements that are rude or unwelcoming but don't cross the line into attacking a person (or the content they've posted) or a group of people. I go into more detail about this in a related answer. In general, you're more likely to need the second option than the first but having two options helps our moderators see the degree to which someone is breaking the Code of Conduct and - in the case of high-flag-volume sites - triage handling the more severe flags first. If you never use the first option, that's fine too. Both flags bring the comment to the attention of our moderators. In addition to this, we've made some adjustments to the text for the other two flag reasons though their intended usage is unchanged. For information regarding the changes to the "no longer needed" flag, see my explanation here. Flag dialogue user interface changes. As part of the ongoing work to standardize the user interface across the Network, when updating this flagging interface, it's been brought in line with Stacks, the CSS & pattern libraries for the Network. As various updates are made, you can expect to see more of the sites' infrastructure become coherent with this design. As you may guess, a lot of this UI design is still a work in progress. Several users have pointed out some concerns they have. If you have some of your own, please feel free to do the same. It's our goal to be as up front and open about these changes as we can be. If you have any questions about the updated comment flagging that's not addressed here, please let us know. See updated flag dialogue text and explanation in the question. Somehow, having two different options with the same subtext "The comment violates our Code of Conduct." doesn't fly with me. Maybe the first one can be changed into something like "The comment violates our Code of Conduct in a particularly aggravating way." or something which captures that intent in simpler English? Decline explanation: After comparing the flag data on Stack Overflow during the period between October 23, 2018 to January 23, 2019 and the same period last year, the indication is that that while there is an increase in these flags overall - 69% more flags - they're actually declined less frequently - 21.6% of the time, down from 25.8%. Considering this, we're going to leave it the way it is. 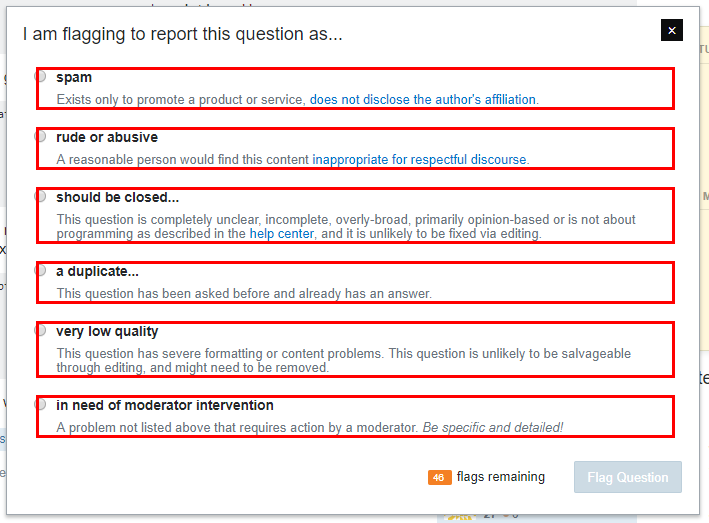 Extend the "other" reason to match the same description as normal flags, i.e, "A problem not listed above that requires action by a moderator". This is because we had some new users use the flag to talk to the commenter, instead of adding a new comment. In the past, I've left alone what I've felt to be sarcastic comments (backhanded criticism) because I haven't felt there was a proper "bucket" to flag them under. Comments like that are a bit subtle, and might not have been recognized under the old categories. While some of those flags of mine were accepted, others were rejected. Are moderators now encouraged to be more accepting of this kind of reporting when the "unfriendly or unkind" category is used? Should I use that category more freely and not worry so much about flag rejection by moderators? What about allowing users to see statistics on how many “unkind” flags marked "helpful" by moderators have been raised against them? General stats on how many people flagged and how many posts were flagged may be good feedback to help folks understand how their posts are negatively impacting people and might ease some of the burden on moderators if it becomes necessary to do more than warn a user. We already display stats on how many people our content has reached, but those stats don’t really say whether our impact was perceived as positive or negative. Just to be clear, only the user and moderators would see these stats. I think making them public would be counter productive. I understand that this is making it more visible to people when they have comments deleted and that might lead to some people arguing with the decision that's been made. My personal belief is that being more transparent is rarely a bad idea. We delete unfriendly comments because we want the community to be more welcoming. Where is the line between what the community will tolerate and what it won't? How can someone know in advance whether their comment will be perceived as unfriendly by the community? One way is to have discussions about how the CoC is being applied and have the community weigh in on meta. 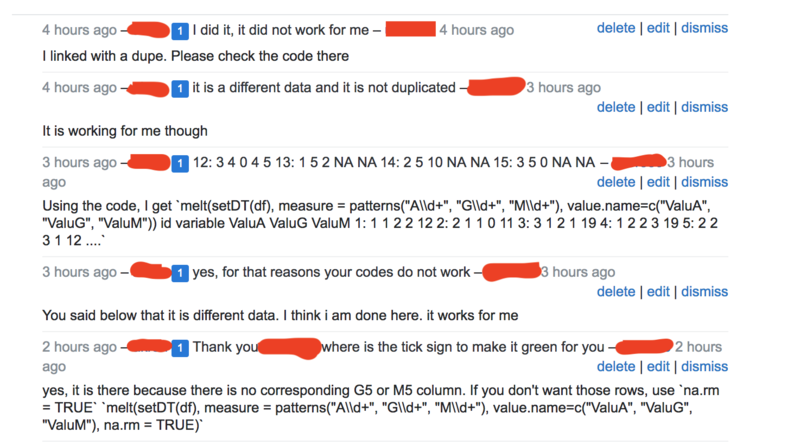 If showing statistics to a user about how many times their comments have been flagged as unfriendly causes them to start a discussion on meta, I don't see that as a bad thing. We let people see down-votes on their posts. Why would letting them see unfriendly flags (that have been reviewed and accepted by the mod team) on their comments be that much different? If we're not going to provide positive feedback on comments (say by flagging something as "friendly"), all we've got to help people learn where we draw the line is negative feedback. It would be useful to be able to drag the dialog so that you can move it to re-read the comment if needed while deciding which flag you want to cast the same way you can with the flag/close question dialog. About the always-visible flag icons being too noisy - have a user preference option to hide them (per site, or on all sites) once the user reaches a certain reputation. 100 rep seems like a decent threshold as that's the site association bonus as well, and if you know how other basic features of SE work, you presumably know how flagging comments works, too. Please add the option to explain any flag; not just the flags for "something else". 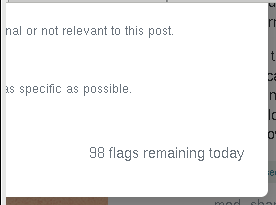 [Moderators] can easily decide whether a flag is valid or not based on the flagging text. If I flag a comment as "no longer needed", I have no way of letting the mod know why it is no longer needed. If a comment has since been addressed in the post, or edited in, or has been handled another way, the mod will have to look at the post the comment was made on to decide that. To help them out, I would like to be able to enter a short message such as "addressed in post" or "clarified by OP" or "dead link replaced by link to Way Back Machine". Other flagging options could use this as well, allowing a flagger to explain why they find something to be abusive rather than "just" unkind. The "unfriendly or unkind" option is currently broken. I just tested out the "unfriendly or unkind" option, and while I got a positive acknowledgement message of my flag being submitted, I checked my flag history, only to find that there was no flag submitted. Interestingly, the red flag indicator next to the comment continues to show up, even after I refresh the page, but when I go to my flag history, there's no record of a pending flag. In the "make flag handling easy and clear for moderators" vein: display aggregated flag stats (e.g. # approved flags of each type, on other posts/comments by the same user whose comment was flagged) directly in the flag-handling UI, and presumably also linked from user pages. When deciding what to do about a flag, the user's history is quite relevant. First time, just clean up and move on. Tenth time, fiftieth time, take stronger action. We need to make sure that moderators reliably know which it is. Right now it's easy for mods to take single-infraction severity into account for deciding consequences, but much more difficult to address ongoing patterns - and the CoC asks us to do this. Please place "It's no longer needed." as the first item in the list because it is apparently the most commonly used item. I imagine that "It's unfriendly or unkind." would be the second-most used item, and accordingly should remain in second place. SO undoubtedly has statistics to confirm the usage frequency. "Something else." should, of course, remain as the last item, leaving the unpleasant words in third place where we only have to look if really necessary. Personal experience and Catija♦, in a comment. "It's unfriendly or unkind." doesn't look really separate from "It contains harassment, bigotry, or abuse. ", but a superset of it, as it's true for both the latter case and the case of subtle put-downs. I would make the text read "It's mildly unfriendly or unkind." instead, which implies that there's no severe rudeness such as harassment, bigotry or abuse. Another issue I have is the return of the "It's no longer needed." text. I suggest changing it to "It's unnecessary.". I assume the harassment/bigotry/abuse reason = rude/abusive flag, and has similar consequences, while unfriendly flags are handled "separately", without some of the consequences (see also this answer). Can a user having a history of unfriendly flags automatically raise a rude/abusive flag with the unfriendly flag history? This will help mods "notice the pattern" so to speak, and basically makes it easier to "escalate" that sort of pattern. The terms "unfriendly" and "unkind" seem very close... at least as a non-English speaker I would not know the difference unless I looked it up. One of the two seems enough. On the other hand, comments that have the appearance of being friendly can still be patronizing (included in the "put-downs" that the Code of Conduct mentions). I think this is completely over the top. This obsession with "being kind" means you are not thinking about the real reasons people would flag a comment. As has already been said, a single violation of code of conduct is enough. An answer, not a comment. It's a small issue, but it's very annoying. Seen on Firefox ESR 52.9. It does not appear to be an issue in Firefox ESR 60.2. I do not see the same issue with the question or answer flag dialog, and didn't have the same problem with the old comment flag dialog. This appears to be independent of whether the site has an old-style custom theme (tested just now on Worldbuilding), new-style custom theme (ditto on Unix & Linux) or no customizations (ditto on Writing). It contains harassment, bigotry, or abuse or it's unfriendly or unkind. The one is just a more severe version of the other. There may be an auto-flag for one but not the other, but this would come down to asking users to judge how severe another user's infraction is - this doesn't really seem appropriate. A user should say "this is inappropriate", a mod should decide what to do about it, if anything. Unfriendly comments are a problem too. Just because someone isn't very rude, doesn't mean they're not rude and there isn't a potential problem that should be investigated. Users could have wildly different views on severity of offensive language. If all the discussion around the "be more welcoming" ... thing has taught us anything, it's that. For example, even while I personally lean towards the side of "get rid of anything remotely offensive", I would be hesitant to use the more severe flag for a comment calling someone else an "idiot" (because it just doesn't seem quite on the level of harassment, etc., but maybe that's just a problem with the flag phrasing, since name-calling is listed there in the Code of Conduct itself). In some contexts regular flaggers may not even flag it at all. So I doubt we'd get much of a useful differentiation if we leave it up to the users. This creates more choices for the user. Didn't we combine a bunch of similar flags for exactly this reason not too long ago? I personally might just (mostly) stick to the "unfriendly" flag, because then I wouldn't have to decide which flag to use. You'll make users flagging in good faith very unhappy. If you're declining flags because people are using the wrong flag, then the message you're sending is roughly: "oh, sorry, this is offensive, but it's not quite offensive enough to fall into this flag, you should've used the other flag instead" (or vice versa?). Given the subjectivity of this, plenty of people will probably just have no idea what you want from them, and stop flagging. If you're not declining flags because people are using the wrong flag, what's the point? This is all unnecessarily complicated. It's a subjective decision. There's only one reason to flag a comment: "It makes me feel bad" (or "I don't like it"). A mod can then read the comment and decide if she feels like the user should be punished. Done. Sure, link the code of conduct, but that's unnecessarily complicated as well. You don't need a formally expressed policy to justify mod decisions. Mods are by definition kind people, because unkind people aren't interested in policing other people's behavior all day. They'll do the right thing. If somebody doesn't like having a comment deleted, the answer is: "It's our site. Go away." Users who don't like mod decisions don't belong on the Stack Exchange network. The users who belong here are the ones who, when corrected, say "Yes, I was wrong. If I don't know what I did wrong, it's my job to figure it out." We're not here to educate them. When you explicitly state what's forbidden, however broadly you state it, you are implying that there may be some behavior that bothers somebody which is permitted. And that person may feel disempowered and hesitate to flag. You don't want that happening. 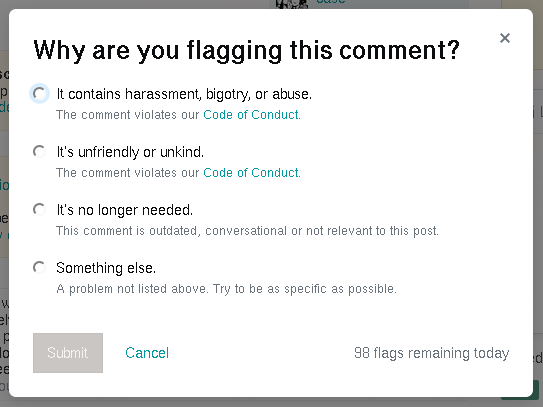 A site where somebody hesitates to flag a comment is not a kind, welcoming site. The only guideline for flagging should be "When in doubt, flag", and the only guideline for mods should be "when in doubt, delete". Not the answer you're looking for? Browse other questions tagged discussion comments comment-flags code-of-conduct .